If you’ve ever met Deborah Emmanuel, you’ll know that she’s someone impossible to forget. Never mind that her hair enters the room before she does — in fact, it was what caught my eye as we were shimmying along to a band that was playing at Neon Lights festival last year (she was also there to perform her spoken word). Image aside, the 28-year-old local author and spoken poet possesses a voice that’s hard to ignore in both written and spoken forms. Her resume impressively details appearances at events such as TEDx, The Singapore Writer’s Festival, Bali Emerging Writers Festival and Queensland Poetry Festival. Her most recent gig was the Red and white, black and blue Australia tour which took her to cities such as Sydney, Canberra, Adelaide and Melbourne in January and February this year. When I Giggle In My Sleep, her first published collection of poetry amasses four years of material. With a confessional and lyrical voice, she touches on grief, love and violence, bringing together personal and social commentaries. Rebel Rites is up next. Due to launch by the end of March and early April, it will detail accounts of her six months in Changi Women’s Prison and six months at The Turning Point, a Christian halfway house. On the music front, her dub/psy/reggae band Wobology’s currently recording their first studio EP, Kaleidoskopik. We catch up with the wordsmith ahead of her reading here at the Buro pop-up. At 11, you dedicated your first poem to your mother as a birthday gift. What was the most recent poem you wrote for someone? A few months ago I wrote a poem for my friend Mukul. He’s a migrant worker and a poet. It is called Birth’s Lottery and laments our inequality and the fact that our opportunities are different purely because we were born in different places and into different families. How exactly did you end up in prison? I was a 19-year-old party girl who occasionally smoked pot and took ecstasy pills. They raided the bar I was in to arrest the DJ. I was sitting at his table. I didn’t even know him but that was irrelevant because I was guilty by association. Singapore is one of those places in which you’re guilty until proven innocent. What was your first day in prison like? Anything like Orange Is The New Black by any chance? My first day in Changi Women’s Prison was terrifying. I was a teenage girl who ended up somewhere she never expected to. I sobbed and did what they told me to. I learned that I would sleep on the floor and be shouted at by wardens all the time…I’ve never seen Orange Is The New Black, but I doubt it is anything like Singapore prison. We never got to wear any make up, for one. Haha! What’s the most important thing you learned about your time in prison, and how has this changed you? I learned that my actions had consequences. Sometimes the consequences are as severe as the action, sometimes the consequences are unjust…but there are always consequences. I never expect to do something and not create a change in my environment. Sometimes that means I’m afraid to take action because of the outcome. Sometimes that means I try to change things which seem hopeless because a part of me believes that change is happening as long as I’m taking reasonable action (i.e. not involving prayers or magic spells)…even if I can’t see the change and even if it’s not measurable change. When did you decide to turn your experiences into a book? I was trying to write a poem for ages but it was a struggle. In hindsight, that is unsurprising (I don’t know how I expected to be able to write one poem based on a year of life-changing moments). At a writer’s group I was a part of in Brisbane someone said “Why don’t you write a factual account?”. When I started writing the account it was clear that the story needed to be told in its full form — the gravity of what I had been through and the underclass that is perpetuated by a system we allow to exist right under our noses but look away from because it doesn’t involve us. Why the title Rebel Rites? I mostly like to write at the dining table and on my computer, sitting upright. Windows open and bright. When I started writing Rebel Rites it was at my friend’s country home in a small town in Australia. There is nothing comparable to writing in the quiet with the occasional bird call in the background and a field to run through when the words fill up too much of my head. Tell us more about the process of writing Rebel Rites. I edited the book a lot before I was finished then at some point had to train myself to keep writing so I could get to the end. Editing was the hardest for me because I struggled to accept that no matter what I do, it will never be good enough because nothing I write is ever good enough. My friend Divya gave me this idea about the book being a living, morphing being. It will never be complete but I have to let it live when it is time for other people to meet it. You tackle a lot of hard-hitting issues in your work, such as being a minority in Singapore. What’s been the best response from people who’ve connected to your poetry? I don’t know if it is the best response…but during a set on my Australia tour a woman ran out of the room crying. It was the most dramatic response I’ve received, for sure! I’m getting used to the fact that my poems make people cry and am trying to own it. What’s the most self-fulfilling thing about being an author, and what about it makes it so compelling and beneficial to the community? The only thing that would make me beneficial to the community is if I was only creating positive impact. The things that drive me as a writer or artist these days is mostly creating awareness and encouraging equality. The challenge for me as a writer and performer is to do those things in a way that is beautiful and engaging; in a way that makes it art as well as activism. Lastly…when was the last time you rebelled? I cut all my hair off a few weeks ago to rebel against myself. I had been wanting to do it for over a year but was afraid of the change and that I would feel negative about my appearance. It’s incredibly hypocritical of me because I discuss how we should disregard beauty standards in my poetry yet I was afraid to cut my hair off because I was attached to how attractive I felt with my dreads and curls. Now with the short hair, people still tell me that I look nice, and it still makes me feel nice. I will shave my head next. The whole image thing is disgusting and confusing and I don’t know when I will figure it out, but it feels right to be thinking about these things and acknowledging that I care even though I don’t want to care. Perhaps sometime in the near future we will operate ourselves as avatars in a computer-generated world and I can just appear as a cuttlefish or something. 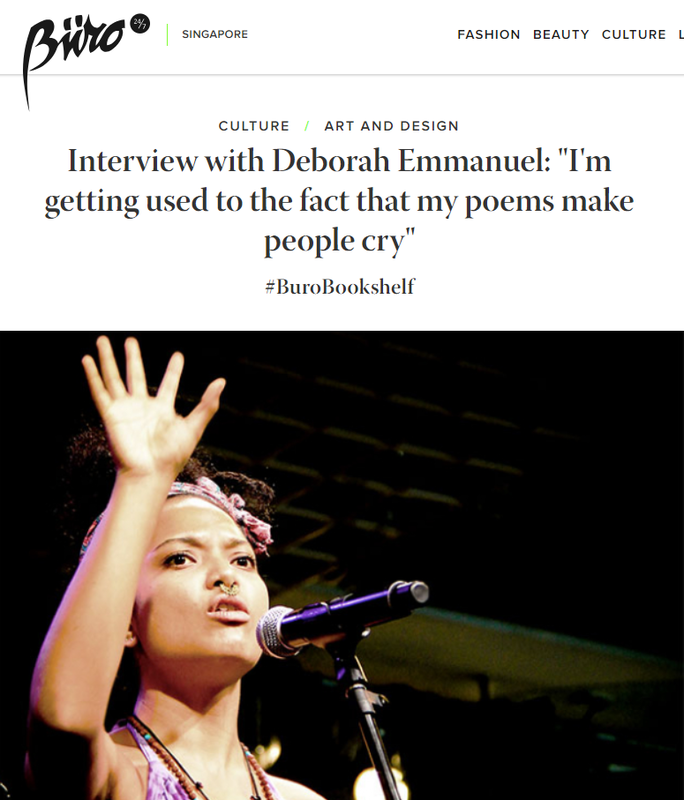 #BuroBookshelf is happening tonight at 7pm at the Buro Pop-up in Scotts Square with poet and authors Deborah Emmanuel, Cyril Wong and Michelle Tan.